The Dot Office complex is located in the southwest part of Krakow, within the Special Economic Zone of the Krakow Technological Park. Therefore, any business activities in the complex can be run based on special, preferential conditions. The Dot Office neighbourhood includes scientific and research units of the Jagiellonian University, as well as international, independent business institutions. The Krakow orbital motorway, with the Skawina interchange, runs in a distance of ca. 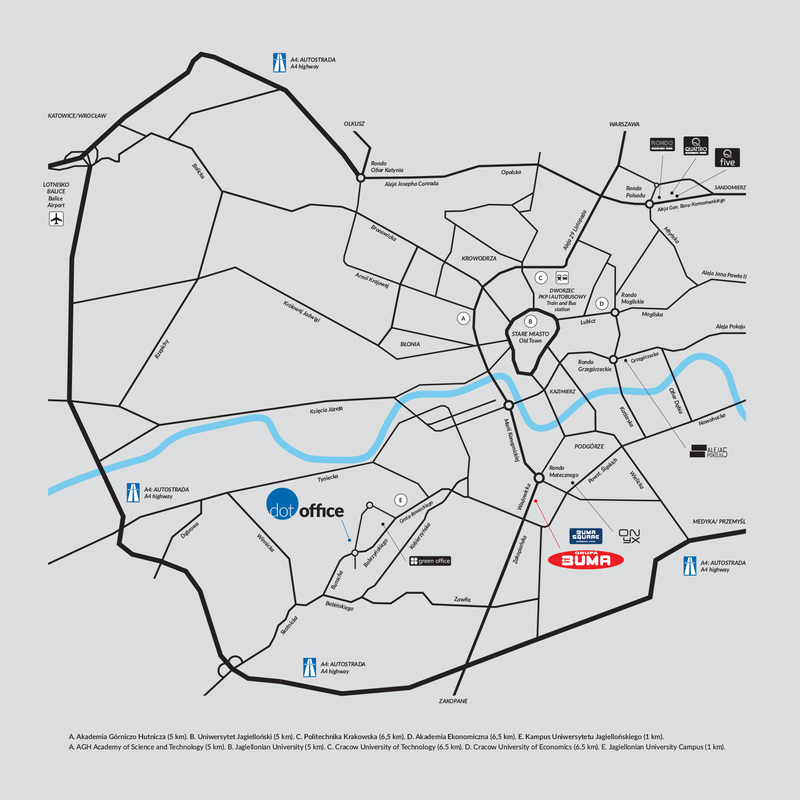 4 km from the facility, enabling exit from the city towards Kraków-Balice airport, the cities of Katowice, Warsaw, Rzeszów, Zakopane, and also facilitating car travels between different parts of the city. In the direct vicinity of the Dot Office complex, there is a multi-space on-grade car park, operating under the Park & Ride scheme, as well as the Czerwone Maki tram and bus terminal, with fast tram service to the city centre. Please click the picture to enlarge. ESC key on your keyboard closes the picture.